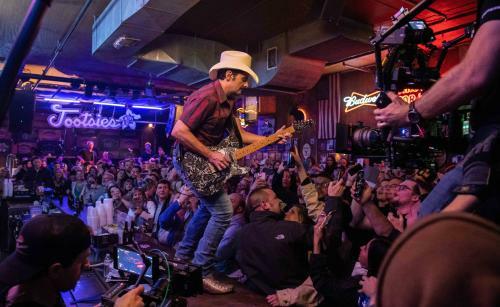 This past Thursday night Brad Paisley continued his Country Nation College Tour presented by Frontier Communications by going to Ohio State University and providing a free concert for the students and community. Special guest for the show was Lindsay Ell. OSU was the third stop on the tour for this year. Earlier today it was announced that Paisley will take his free concerts to six additional IMG College partners throughout September and October. The Country Nation College Tour presented by Frontier Communications will stop at The Air Force Academy on Thursday, September 29 before heading to East Carolina University on Thursday, October 6. Paisley will then travel to University of Connecticut on Friday, October 7, University of Nebraska on Thursday, October 13, University of Kansas on Friday, October 14, and the University of California, Los Angeles on Friday, October 21.